Quick easy chicken recipes that your whole family will love. Our goal for this healthy chicken recipes page is to make it easy (or at least easier) for other working women to cook healthy, nourishing meals for their families. Below are our favorite quick chicken recipes. Healthy cooking is something close to our hearts since, not only are we all working mothers with between two and five children to care for, we are also taking time to share what we have learned on this website. If we can do it, you can too! Better yet, by compiling our favorite quick easy chicken recipes, we are working to make it easier for you than it was for us. Submit Your Favorite Healthy Chicken Recipes Now! One of the biggest challenges for working women is cooking healthy food for their family to eat. Even though it is a challenge, it is one of the best things you can do for your children. Everything that enters your child's mouth will affect him - either in a good way or a bad way. Free-range organic meats and organic vegetables are wonderful for children and will help ensure that they experience optimal health. At the same time, food additives, the chemicals in processed, conventional food and the hormones present in conventional meat can compromise you child's immune system and can lead to learning disorders such as AHD and ADHD. 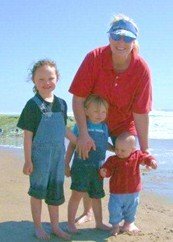 Therefore it is vital that you provide your children healthy, chemical-free meals, thus we are passing along our favorite quick easy chicken recipes. When making these quick easy chicken recipes, please use the best quality chicken available to you. Why? Although chicken is currently promoted as one of the healthiest meats to consume, there are some serious down sides to it. First off, conventionally raised chicken is not healthy to eat. Raised indoors in close proximity to hundreds of other birds, they are routinely fed antibiotics. Over half of the antibiotics fed to mass-produced farm animals including chickens, are identical to the ones administered to humans. As has been well publicized in the media, overuse of such antibiotics can lead to strains of bacteria resistance to the antibiotic, opening doors wider to the potential for human disease. Chicken feed is comprised mostly of soy for the protein. The majority of conventional soy is genetically modified as well as heavily sprayed with pesticides. Even organic soy should be avoided not just because it has not been part of normal chicken diet traditionally, but because it contains phyto-estrogens which are passed along in the chicken meat, fat and egg yolks. For more about why you should avoid eating soy read The Whole Soy Story by Kaayla T. Daniel, PhD, CCN and check out Soy Alert! The stressed living conditions conventional chickens endure can also cause "stunted" meat devoid of taste and total health value, hence creating the need for chemicals to artificially moisten the meat. Most recently, it has been reported that chicken feed includes arsenic, resulting in chicken meat contaminated by inorganic arsenic. You don't really want to be serving up arsenic when you cook up one of our quick easy chicken recipes do you? Unfortunately, there are problems with "organic" and "free range" chicken as well. Free-range chickens are fed the same conventional chicken feed that contains heavily sprayed, GMO corn and soy. Same problem with "cage-free" chickens. Organic chicken is the best, but even organic chicken is fed organic soy as their main source of protein. While theoretically this soy is not genetically modified (one hopes that it wasn't grown near conventional soy where cross pollination could occur), it still contains all the same phyto-estrogens. In addition, most organic chicken you can purchase at the store is not free range. Chickens are omnivores, not vegetarians as many people assume. Historically, chickens are meant to get the majority of their protein form eating bugs, worms and nettles, not from soy. Being fed a vegetarian diet prevents them from achieving optimal health since they are denied the nutrients they would normally find scavenging around the farm or pasture. For all the reasons listed above, the very best chicken to eat is both truly free-ranging (allowed outside to eat bugs, etc.) and fed only organic feed as a supplement to all the great nutrition they forage on their own. 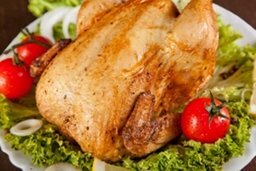 Quick chicken recipes are good but cheap chicken meat is not! You will usually have to purchase this type of chicken from your local farmer. These chickens don't come in packages of drumsticks or breasts, they are usually only available as whole birds. Don't worry though, it is actually very easy to cook a whole chicken. You can also buy 4-5 whole chickens at a time and simply cut them up into pieces. In this way, you can have enough breasts, thighs and drumsticks to cook one recipe that will yield several meals as well as great bones to make a big batch of stock both for use in your recipies as well as for soup! Simply freeze the extra meals for use when you are tight on time. Having trouble finding good chicken in your area? The easiest way to find a great local resources is to join a local Weston A Price chapter. Weston A Price also publishes an annual offers Shopping Guide with great local suppliers listed. If there just isn't healthy chicken available near you, consider mail ordering it. Dr. Mercola offers organic, free-range chicken on his website, but it isn't soy-free. This fried chicken recipe is both healthier and tastier than what you can get in a restaurant. It is wonderful hot with mashed potatoes and gravy or cold with potato salad. Here are a bunch of quick and easy ways to cook that wonderful, organic, whole chicken you just purchased in your crock pot or slow cooker. Our favorite Chicken Corn Chowder Recipe, try this zesty, easy-to-make, crock pot corn chowder recipe on a cold night. Have a favorite healthy chicken recipe you would like to share? What about that secret recipe your granny used to make that the whole family loved? 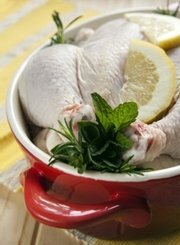 Remember, chicken prepared and served the traditional way with the skin and fat is the healthiest! Many old recipes reflect this. TIP: Since most people scan Web pages, tell us why you like this recipe so much in the first paragraph. Don't forget to add any cooking tips or substitution information at the end! Do you have a picture to add of your completed dish or steps for making it?